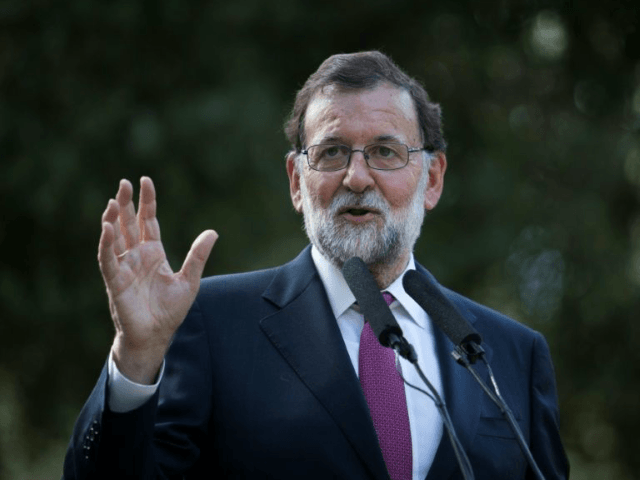 Spanish President Mariano Rajoy will visit the White House on Tuesday, where he will reportedly ask President Donald Trump to declare his opposition to the Catalonia independence referendum scheduled for October 1. The UK Express reports that Rajoy and Trump have spoken several times over the phone, and met at the NATO summit in Brussels in May, then again during the G20 summit in July. Their last conversation followed the August terrorist attack in Catalonia. According to the Express, President Trump has invited Rajoy to stay at the Blair House instead of a hotel, which is being taken as a sign of the importance the Trump administration places on the meeting. Catalan separatists held rallies in towns across the region on Sunday, vowing to press ahead with the referendum and declare independence if it passes, even though the Spanish government has declared the vote illegal and arrested some of the officials who organized it. “Several thousand protesters gathered in central Barcelona on Sunday chanting ‘We will vote!’ and handing out ballot papers. The crowds began whistling and booing a police helicopter during speeches by the protest organizers, showing growing anger among the referendum supporters about the increased police presence,” Reuters reported. Thousands of additional police officers from across Spain have been sent to Catalonia ahead of the vote, arriving on chartered ferry boats. This caused a fresh ripple of controversy when the Interior Ministry in Madrid announced it would take command of all law enforcement personnel, including the local Catalan police. After initially refusing to abide by this order, the Catalan police relented and announced they would comply. The Associated Press reports that Catalan police officers feel “caught between their oath to the nation’s constitution and loyalty to local leaders who have vowed to create a new European state.” No doubt this tension will increase considerably if the referendum passes and Catalan leaders actually declare independence. On Monday officers of the Guardia Civil, Spain’s national police, raided 31 council buildings across northeastern Spain to seize documents related to the referendum vote. The operation was said to be focused on documents signed by local mayors in support of the referendum and plans to use government buildings as polling stations. According to the UK Express, over 750 local mayors are currently under investigation for supporting the independence movement. Another individual facing action by the Guardia Civil is Catalan radio host Monica Terribas, who has been accused of endangering the police and “implicitly encouraging disorderly conduct” by calling on her listeners to report on the anti-referendum raids. “It is unfortunate that the paranoid drift of some media reach the point of being useful for terrorists, drug traffickers or any other delinquent, thus facilitating the possible committing of crimes with unpredictable consequences,” the Guardia Civil said of Terribas in a statement. Catalan officials responded by essentially accusing the Spanish state of going crazy in its zeal to crush the independence referendum. The outcome of the vote is anyone’s guess. Polls seem to indicate Catalans strongly insist upon their right to hold the independence referendum, but lean against actually voting to separate from Spain. The intense police crackdown seems curiously counterproductive from that perspective, as it threatens to build both local support and international sympathy for the separatist movement. Generally speaking, the free world does not like seeing votes suppressed, or enjoy images of police officers carting away piles of ballot paperwork. There is one last card for Spain to play: to arrest Catalan President Carles Puigdemont before the independence referendum is held. The Spanish attorney general pointedly refused to rule out that possibility in comments on Monday, noting that Puigdemont could be charged with “disobedience, breaching public duties, and misuse of public funds” for proceeding with the vote, as the UK Guardian reported. All parties seem to recognize that arresting Puigdemont would be a doomsday option, although one gets the sense from the Guardian piece that Spanish ministers are mostly trying to decide whether it would be better to arrest him before the referendum, or wait until a bit later in October. The most stern warnings issued by the Spanish government say that declaring independence would be tantamount to rebellion or insurrection, stealing port facilities and infrastructure that belong to the Spanish people. Many of Madrid’s denunciations including warnings that the independence vote might be tampered with; depending one’s point of view, they’re either taking strong but reasonable precautions against a dodgy ballot, or maliciously working to delegitimize the referendum by making it look as if the vote could not possibly be held fairly. If the police move to arrest the Catalan president or physically prevent residents from voting on October 1, the response would most likely be unpleasant, but if the referendum is held and independence passes, Madrid would have a tough time retroactively convincing Catalans that it wasn’t a clean vote, especially if Puigdemont fulfills his promise to plow ahead with separation within two days of a “yes” vote.